A guitar that offers plenty for the performing or recording musician. Smart design, build and execution;. Very credible plugged-in acoustic voices. An inspired clean-to-crunch magnetic voice. Our sample had a low-output high E on the acoustic voices - it would be nice if Fender supplied another saddle compensated for an unwound third string. You don’t need us to tell you that there’s a huge chasm between a steel-string acoustic and a solidbody electric guitar. But that hasn’t stopped a considerable number of designers trying to bridge that gap, some with more success than others. For many, adding a piezo-loaded bridge and associated circuitry to offer acoustic-like sounds to a solid or semi-solid electric has been the chosen path; bold attempts such as Parker’s Fly truly pushed the boundaries of sound and taste. Many more conventional-looking piezo/magnetic ‘hybrids’ continue to plough that furrow with greater success. But start with a more acoustic-like platform and offer magnetic electric sounds alongside more conventional electro-acoustic sounds, and we have a whole different ballgame. It’s little surprise that large-scale acoustic makers such as Godin and Taylor have had significant success with this route. It’s also the starting point of this new Fender design: an acoustic guitar with a range of plugged-in electro-acoustic voices and an added magnetic electric surprise. It’s certainly a different-looking Telecaster, and is available in five top colours - the sides, back and neck remain natural mahogany on each along with the distinctive small sound hole, or sound port. It’s interesting, too, that the actual colour of the spruce top and what appears to be inset purfling and soundhole rings are applied by a printing process. Under a loupe, you can see that on the ‘purfling’. In theory at least, this means that any image could be printed onto the face of the guitar. Maybe it’s the combination of that sound port and the colours of the body that suggests the ‘modified Tele’ shape is smaller that the real deal (the inset spruce top of our review sample is an opaque black colour that contrasts with the mid-brown of the natural mahogany). In reality, it’s not. Not only are the flanks below the waist slightly chubbier, the body length is extended - both areas by between 6mm and 10mm. The 44.5mm body depth is identical to our reference American Professional Telecaster Deluxe Shawbucker. Thanks to the walled design of the sound port, you can’t peer inside the guitar, but removing the central backplate, you can see the hollow construction - the mahogany body is cut out leaving relatively thick sides and back, approximately 10mm to 12mm. There are two longitudinal braces that extend beyond the bridge - not dissimilar to an archtop - but no transverse or cross braces, although there’s a thin reinforcing plate under the bridge. One consequence of the hollow construction is the weight, or lack of it: at 2.2kg/4.9lb, it’s way lighter than even a lightweight Telecaster. As to the mahogany neck, it’s certainly very close to the ‘modern deep C’ of the American Professional, around 0.5mm thinner than our lacquered maple-’board Deluxe, with a nut width of 42.7mm, slightly broader string spacing of 36.5mm, and depth at the 1st fret of 20.5mm filling out to 23.65mm by the 12th. Despite the thin sealer-like polyurethane neck finish, you can feel the grain (equally thin polyester is quoted for the body finish). A light rub with 0000 wire wool accelerates the wear for a slightly silkier feel, and while the streaked brown/ black ebony ’board has a flatter 305mm (12-inch) radius compared with the Am Pro’s 241mm (9.5-inch) measurement, it still feels like a contemporary USA Telecaster. Ditto the frets. But there are plenty of nice touches: the rib-cage contour and the rounded edge to the lower bass-side bout; the Elite-style sculpting of the otherwise square-nosed heel; the back plates and even the heel plate are recessed and flush with the body surface. And even though we have an acoustic-style bridge, there’s the Micro-Tilt adjustment and nut access Bi-Flex truss rod that make setup considerably easier to dial in than the majority of acoustics. The onboard sounds are selected, firstly, by a five-position lever switch called the Voice Selector and, secondly, by the lower of the two rotaries, the Mod knob. In what we know as neck position (position 5) and with the Mod knob rolled fully anti-clockwise (voice A), we have the quoted sound of a Sitka spruce/rosewood dreadnought. Rotate the Mod knob fully clockwise and we have voice B, an Alpine spruce/ rosewood auditorium. Pull the selector back to position 4 and we have Englemann spruce/maple small body (A) and a Sitka spruce/mahogany dreadnought (B). In position 3 on the Voice Selector, we have a slightly different proposition: a Sitka spruce/Brazilian rosewood dreadnought (A) and as you move the Mod knob clockwise it introduces the body sensor pickup for those percussive tapping techniques and, says Fender, “enhanced harmonics that pop”. Position 2 is a similar blend with another Sitka spruce/mahogany dread (A) and the ability to blend in the magnetic pickup as it moves to position B. Finally, position 1 is just the magnetic pickup (A), but as you move it clockwise towards position B, a light crunch is added. The output is simply a mono jack. This is not the dual-voice-style hybrid where you can simultaneously run the piezo and magnetic outputs to different amps. There’s no onboard tone control, either, just volume. Of course, all that internal circuitry needs powering and there’s a rechargeable Lithium-ion battery inside that is charged via USB to a small connector on the jack output, which also has an LED indicator. If you’ve come across Fishman’s Greg Koch Fluence pickup set before then you’ll be familiar with this. To fully charge the battery, Fender quotes four to five hours (note that you can charge and play simultaneously) and that should give you 20 hours of playing time. Apparently, that small LED will flash red when you’re down to around two hours of charge. Not only is this a superbly comfortable guitar that disappears on a strap, played seated it melds to your frame and is quite possibly the near-perfect sofa noodler. It does have an acoustic voice that is considerably louder than a solidbody, though obviously a lot less than even a small parlour acoustic. It’s not designed to have a microphone stuck in front of it, but if you did then you’d get an almost an acoustic archtop-like sound with plenty of quick attack and a trim low-end. And although our left hand is telling us we’re playing an electric, it’s also moaning a bit because these are acoustic strings. Hooking up the guitar to our usual stage acoustic pedalboard and both an AER Compact 60 and Line 6 StageSource, there’s little doubt we’re hearing good-quality ‘mic’d acoustic’ voices, more studio-like than if we run an old-school piezo-loaded electro into the same system. The acoustic voices are rather good, although, to be fair, the subtle differences are quite marginal - not to mention if you’re blending them in position 5 and 4. You hear slightly more definition to position 5’s auditorium and a trimmer bass than on the dreadnought; likewise, there’s a subtly ‘smaller’ voice to the maple parlour in position 4 compared with the really quite classic spruce/mahogany dreadnought. The Sitka/Brazilian rosewood dreadnought in position 3 is surprisingly valid with a strong defined voice, and although adding the soundboard transducer doesn’t exactly make the harmonics pop, it does give a slightly roomier ambience perhaps and is a nice nod to the more progressive percussive/looper players out there. The spruce/mahogany dread in position 2 gives a very similar flavour to that in position 4, but adding in the bridge magnetic pickup - the only ‘electric’/’acoustic’ mix - gives another texture. On the one hand, it suggests an older electro-acoustic sound, but this is where the guitar takes off into a more creative path blurring the lines between acoustic and electric, especially if you run it through your electric pedalboard. While position 1 is not the sort of sound you’d expect on an electro-acoustic guitar, don’t dismiss it. It’s a slightly compressed Tele but with noticeable clarity, and bringing in a little crunch via the Mod knob is surprisingly useful. It’s a pretty rootsy sound, too, that gets you into a very Stones-y Street Fighting Man kind of territory where electric and acoustic worlds morph, even though the sustain envelope from the acoustic-like response is different to that of a real Telecaster. Compared with a conventional Martin electro, it does feel a little tighter, perhaps lacking a little sweetness. There’s less of that almost piano-like bass string response from what we hear from a Tacoma rosewood dread, too. Also, our sample had a slightly light top E string response - it’s certainly not the first under-saddle with that issue and we doubt it’ll be the last. Strings, too, will make a big difference. We restrung with Martin’s new MA175T LifeSpan 80/20 Bronze treated - and there’s little reason why you can’t use electric strings, although the saddle is compensated for a wound third, of course, and the magnetic pickup is magnetically compensated for bronze not nickel. This is very much an electro-acoustic with some added magnetic electric flavour. It has enough acoustic volume for enjoyable unplugged practice. For pretty instant recording, you have a good vehicle here and plugged in to a full-range acoustic amp or PA it’s a very credible sound. The magnetic electric sound might seem a bit of an add-on, but it works, and having the ability to just dial in or out a little crunch is actually quite a revelation. We gigged it into our standard pedalboard and electric amp to test its electric side and had zero issues, and while we wouldn’t want to head off for a function set with this guitar alone, on some rootsier numbers it added a dimension we didn’t normally have. That said, the lack of a tone control is a drawback, particularly because the magnetic sound is quite pristine and this writer really missed the depth of a neck pickup voice. Yet there is a rather inspiring ‘where can I take this?’ aspect to the guitar that may well seal the deal for the creative player. In basic terms, there’s the range of the easy- access 22-fret neck, not least for high capo positions if you need some mandolin or cavaquinho-like sounds. It’s an exceptional slide guitar, too. Then there is the ‘no rules’ to what amp or outboard gear you use, not to mention specific patches from your Helix, for example. It is also a guitar that you really have to play to appreciate what it can actually do. 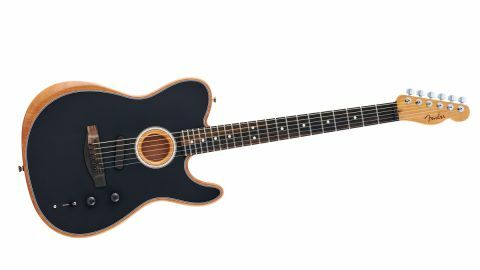 With the same full list-price as the Fender American Elite Telecaster, you might think this Acoustasonic Telecaster is over-priced. However, it has a tactile thin finish over the more conventional gloss body/satin neck of the Elite and presents a quality build, not to mention the substantial development in its considered and intelligent physical and electronic design. The Acoustasonic comes with the nicely rugged FE1225 electric guitar gigbag, not the Elite’s smart moulded case, but its five colour options are only one short of that Elite Tele, and while any design that alters a classic guitar’s iconography will always have its detractors, it wouldn’t be a deal breaker to us. So long as you understand what it can and can’t do, as a modern electro-acoustic with a very credible magnetic electric voice it offers plenty for the performing or recording musician, particularly if you feel happier with a more electric-like guitar. Aside from some classy plugged-in acoustic sounds, the potential to shape new ones both onboard and with effects and outboard processing is more than evident. That isn’t entirely new, of course, but the way Fender has rejoined the party is - from a player’s perspective - extremely straightforward in use with considerable potential. Don’t knock it till you’ve tried it!